Expectant parents-to-be, if there's one wardrobe essential we would say you must own at least one of during the duration of your pregnancy, it would be a knit maternity dress. Why? Because it's comfortable, stylish, versatile, and usually stretches with your growing baby bump, which means it's a piece you really can make use of all three trimesters. Now we searched far and wide to find our favorites currently available for purchase online. From a classic black jersey-knit stretch dress to a pretty gingham-print version that would look adorable with classic white sneakers, we're certain you'll find a style in the mix that you'll want to wear on repeat. 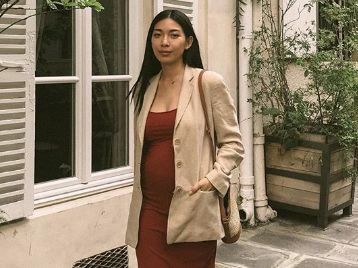 So read on to see and shop the chicest knit maternity dresses that are guaranteed to garner you instant and endless compliments. Available in sizes 12 to 14. Next up, shop the most stylish maternity clothes for work.